There are Chaos Space Marine conversions, and then there are CHAOS Space Marine conversions. I think it's fair to say that this Land Raider falls into the second category. There is so much baroque detail added onto this model, it's insane. I could look at these pictures for an hour straight and still not be able to take in all of the detail. I love when Chaos vehicles truly look like something a demonically inclined eight foot tall murder machine of a man would drive around, and not just a loyalist tank with some spikes stuck on. Not only is the conversion work extremely intricate, but so is the painting. Just take a look at those freehand faces subtly painted onto the purple areas. 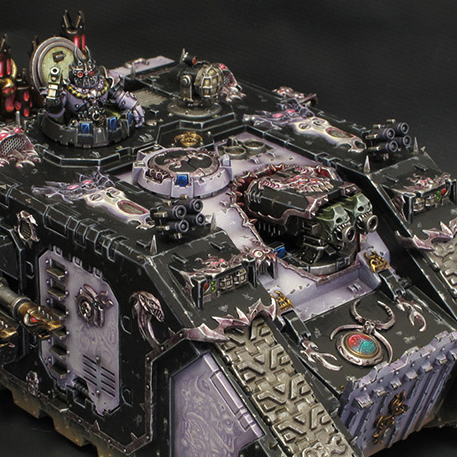 Emperor's Children paint jobs can run the risk of being gaudy, and their conversions can most definitely run the risk of being tasteless. This tank safely navigates it's way around both. I really love the pale purple color coupled with the black. It's reminiscent enough of the traditional purple and pink scheme, but more subtle. There is something about lilac that just resonates with Slaanesh, maybe it's because that color is used a lot by GW on their demons. 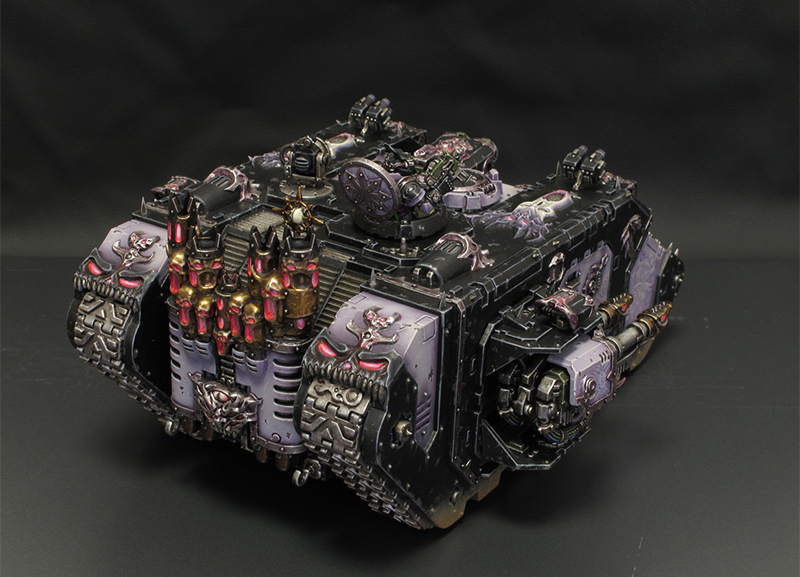 I also like that a purple shade was used on all of the metallics, it really helps tie it all together. The paint scheme as a whole is desaturated enough to come across as something that could exist in the real world. I just had to include this rear shot as well. I think those exhausts from the Maulerfiend should be required on all Chaos vehicles, they are just so cool. Look at those track guards as well, spectacular. 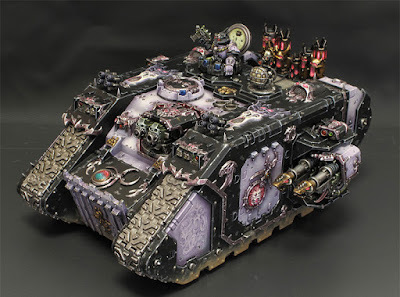 This Land Raider just perfectly embodies what I think of when I picture a Traitor tank. It has just the right amount of baroqueness and detail while also being subtly unnerving.